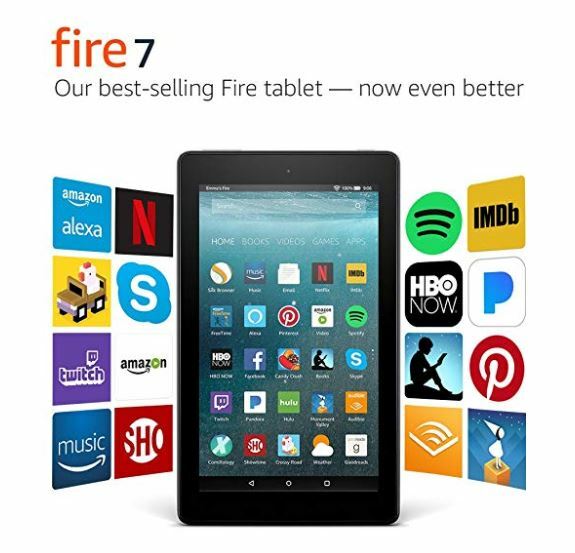 HURRY over to get this Fire 7 Tablet with Alexa, 7″ Display, 8 GB, on sale for $29.99 Shipped (Retail $49.99). -Beautiful 7″ IPS display with higher contrast and sharper text, a 1.3 GHz quad-core processor, and up to 8 hours of battery life. 8 or 16 GB of internal storage and a microSD slot for up to 256 GB of expandable storage. -Just ask Alexa for quick access to the information and entertainment you want. Ask questions, play music, check your calendar, get the news, weather, and more. -Ask Alexa to call or message almost anyone, or make video calls to family and friends with a Fire tablet, Echo Spot, Echo Show, or the Alexa App. Instantly connect to enabled Echo devices. -Enjoy millions of movies, TV shows, songs, Kindle eBooks, apps and games – including Netflix, Facebook, HBO, Spotify, and more. -Prime members get unlimited access to over a thousand books and magazines, millions of songs, and thousands of movies and TV episodes – at no additional cost. -Watch downloaded videos anywhere with a Prime membership, Netflix plan, or Showtime subscription.